Protection from scratches on your iPhone is a must, and Power Support's crystal film for iPhone 3GS/3G is the perfect solution. Protection from scratches is a must, and Power Support's crystal film for iPhone 3GS/3G is the perfect solution. This custom-fit screen protector allows for the vibrant colors of your LCD screen to shine through without compromising picture quality, touch screen sensitivity or any functionality of your iPhone 3GS/3G. With advanced silicone static-cling adhesive technology, this film does not require a difficult installation process and is residue free. 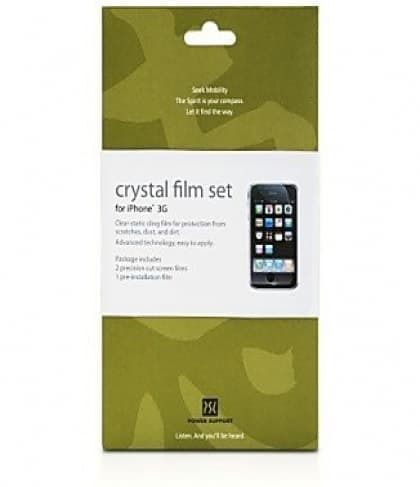 Power Support Crystal Film Set for iPhone 3G 3GS.